Robert Wright's new book, THE EVOLUTION OF GOD, has performed an unusual feat  it is a book about religion with the capacity to make both believers and non-believers uncomfortable. 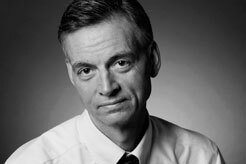 Robert Wright believes that "God," the human concept, can evolve  indeed that it already has. And though Wright personally believes this concept is an illusion, he thinks that the illusion might just be evolving in a way that reveals some underlying truth, that comes ever-closer to describing the divine. He unfolds his argument while charting thousands of years of the history of belief, from the stone age to the modern era. Wright hopes this complex argument can partially bridge the gap between believers of different faiths and non-believers alike. And it's necessary, Wright tells Bill Moyers on the JOURNAL, because, "Religion will be the medium by which people express their values for a long time to come, so it's important to understand what brings out the best and the worst in it." Wright argues that humans create gods that speak to their circumstances. As human civilizations have changed  and Wright believes progressed  humanity's concept of God has changed: "The God that I show evolving is undergoing a process very analogous to natural selection. You know? New traits arise, and if they succeed in enhancing the power of the God, by, for example, attracting new believers, then they remain. And if they don't work for one reason or another, they fall by the wayside. So, God has evolved very much the way you know, human organism evolved through natural selection." "The good news is that when people find themselves in a kind of interdependent relationship, when they see that they can gain through collaboration or that they don't need to be threatened, then doctrines of tolerance tend to emerge. So, A) we at least have an idea of how you would need to arrange the world to bring out the best in religion. And B) to some extent, it seems to happen naturally. There is this growth in kind of the scope of social organization that draws people together." For all its optimism, its an argument challenging to believers and non-believers alike. Writing in CHRISTIANITY TODAY, Dinesh D'Souza takes issue with Wright's basic premise that God is an illusion that needs to be "reconciled with modern secular liberalism." D'Souza concludes that Wright fails to map "some plausible route by which religions can modify their precepts from what believers hold to be true into what Wright holds to be useful." And on the other end of the spectrum, non-believers question Wright's conclusion that the rise of more tolerant religions reveal any divine force. In THE NEW YORK TIMES BOOK REVIEW, Paul Bloom says, "I share Wright's wonder at how nicely everything has turned out. But I don't see how this constitutes an argument for a divine being." Robert Wright is editor in chief of Bloggingheads.tv and the author of THE MORAL ANIMAL (Pantheon, 1994), NONZERO (Pantheon, 2000), and THE EVOLUTION OF GOD (Little, Brown, 2009). He is a contributing editor for THE NEW REPUBLIC and a contributor to TIME and SLATE. He has also written for THE ATLANTIC MONTHLY, THE NEW YORKER, THE NEW YORK TIMES MAGAZINE, FOREIGN POLICY, and the op-ed pages of THE NEW YORK TIMES, THE WASHINGTON POST, and THE FINANCIAL TIMES, among other publications. His books have been translated into more than a dozen languages, and his awards include the National Magazine Award for Essay and Criticism. As a Schwartz Senior Fellow at the New America Foundation, Mr. Wright writes on a wide range of issues related to technology, religion, and foreign policy, particularly the war on terrorism. His 1994 cover story for THE NEW REPUBLIC, "Be Very Afraid," warned about the dangers of weapons of mass destruction falling into the hands of terrorists. In 2000, in NONZERO, he noted how the evolution of information technology could exacerbate this problem, facilitating the translation of intense hatred into massive lethality. His most recent book, THE EVOLUTION OF GOD, touches on a number of contemporary issues, including how to foster interfaith tolerance amid globalization. Mr. Wright is now focusing on how to shape a foreign policy that reckons with such trends, paying particular attention to issues of global governance. Are fear and violence the inevitable consequence of clashing beliefs, or is a more tolerant world possible? BILL MOYERS ON FAITH & REASON explores this question with leading thinkers on the relationships between religious fundamentalism and democracy, equality, and human rights. Bill Moyers talks to Sister Joan Chittister, member of the Benedictine Sisters of Erie, PA, a social psychologist with a doctorate from Penn State University, regular columnist for NATIONAL CATHOLIC REPORTER, and the author of more than 30 books. The conversation focuses on the media's moral responsibility to report accurately on the social, economic and political injustices plaguing society. Businessmen and professors William F. Baker and Michael O'Malley have travelled across the country seeking the kindest companies and leaders. They found that the better employees were treated, the most successful companies were. The rule applied both to big companies like Google and small family businesses where kindness is part of the owner's culture. Now they have put all their experiences into LEADING WITH KINDNESS: HOW GOOD PEOPLE GET CONSISTENTLY BETTER RESULTS. Web site for THE EVOLUTION OF GOD. "Why the 'New Atheists' are Right-Wing on Foreign Policy"
By Robert Wright, THE HUFFINGTON POST, July 13, 2009. By Robert Wright, THE ATLANTIC MONTHLY, April 2009. Robert Wright interviews prominent thinkers on the meaning of life. Charlie Rose interviews Robert Wright about his book NONZERO. Robert Wright's talk at the 2006 TED conference. Wright's biography as Schwartz Senior Fellow at the New America Foundation. Review of THE EVOLUTION OF GOD. By Dinesh D'Souza, CHRISTIANITY TODAY, July 7, 2009.
Review of THE EVOLUTION OF GOD. By Gregg Easterbrook, THE WALL STREET JOURNAL, June 8, 2009.
Review of THE EVOLUTION OF GOD. By Paul Bloom, THE NEW YORK TIMES, June 24, 2009. "Non-Evolution of God, Part 2"
Discussion of THE EVOLUTION OF GOD. By Nicholas Wade, THE NEW YORK TIMES, June 10, 2009. In his new book, THE EVOLUTION OF GOD, bestselling author Robert Wright examines how the idea of God has changed through history. Wright sits down with Bill Moyers to discuss why he thinks the notion of God is imperative to a moral society. Explore highlights on faith and spirituality from BILL MOYERS JOURNAL, NOW WITH BILL MOYERS, THE WORLD OF IDEAS, and GENESIS: A LIVING CONVERSATION. View the entire series online and explore many perspectives on topics like faith and science, myths and sacred texts, and more. Bill Moyers talks with two environmental activists who are disappointed with the President's progress on climate change. Also, check out the debate among environmentalists over Obama's initiatives. Review the health industry documents cited in the JOURNAL interview with former CIGNA insider Wendell Potter. And review the health care plans now under consideration.